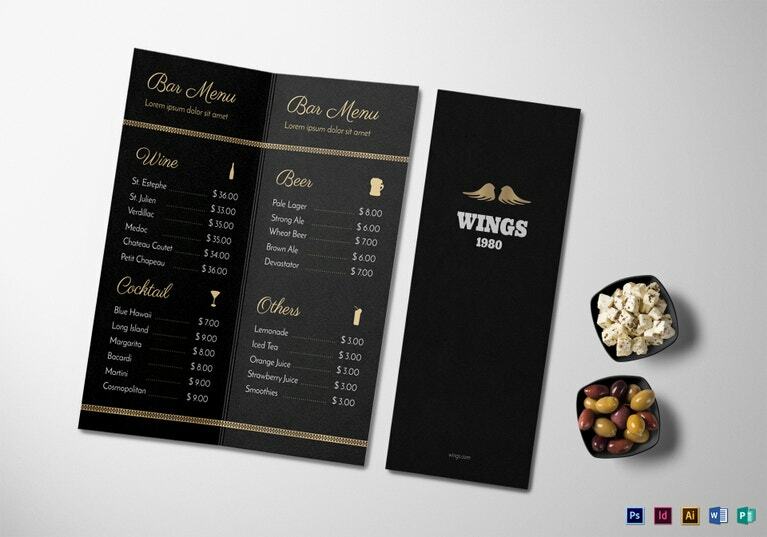 Menu card creation is one of the most important steps when opening or reinventing any dining establishment. Restaurateurs need to invest in a well-designed menu card since these cards will also serve as a business marketing tool. 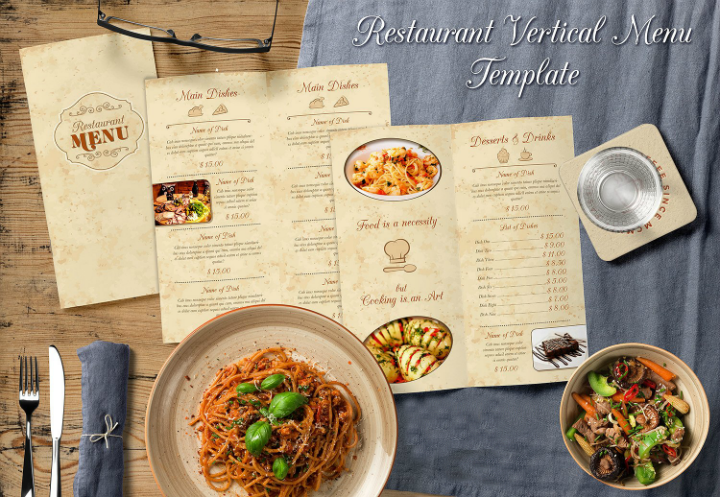 In this article, we provide more than 20 examples of menu card templates for different kinds of restaurants and dining places. More specifically, all menu templates listed in this collection are available as InDesign files. InDesign templates are created using the desktop publishing software Adobe InDesign. This software program allows users to create, format, and layout pages and images digitally. Template files created using this software will retain the .indd extension name. Adobe Indesign is not limited to creating menu templates. You may also create business card templates, rack card templates, brochure templates, and other printable templates using InDesign. This is the preferred software of choice for those who are integrating a lot of text, paragraphs, and images into a template design. However, if you want to add vector images into an InDesign template, you will need to create the vector image using Adobe Illustrator (or similar software) before you can use it in InDesign. This is because InDesign is not equipped to create vector illustrations or images. Basic InDesign skills can easily be learned and you may readily use this knowledge in making minor edits on any pre-made InDesign template. 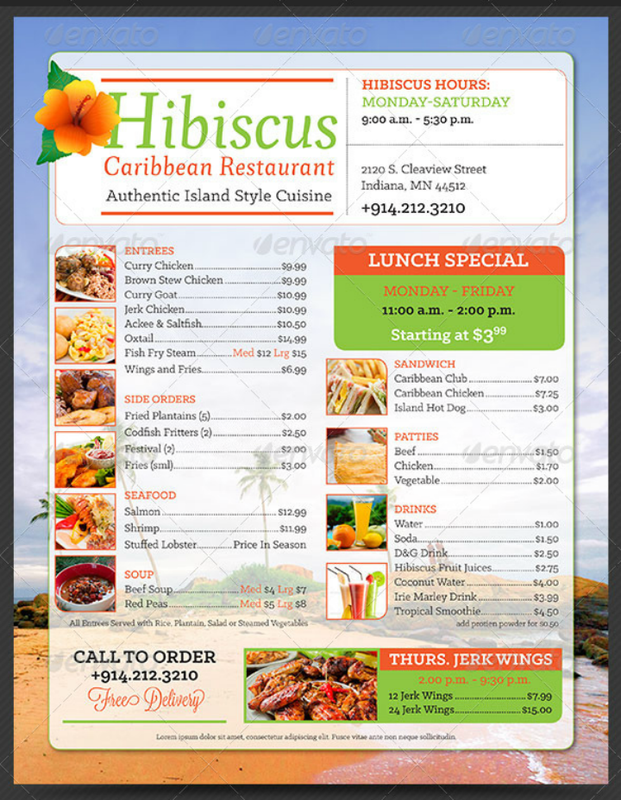 Embedded below are various restaurant InDesign menu templates that you could use for your own restaurant’s menu cards. 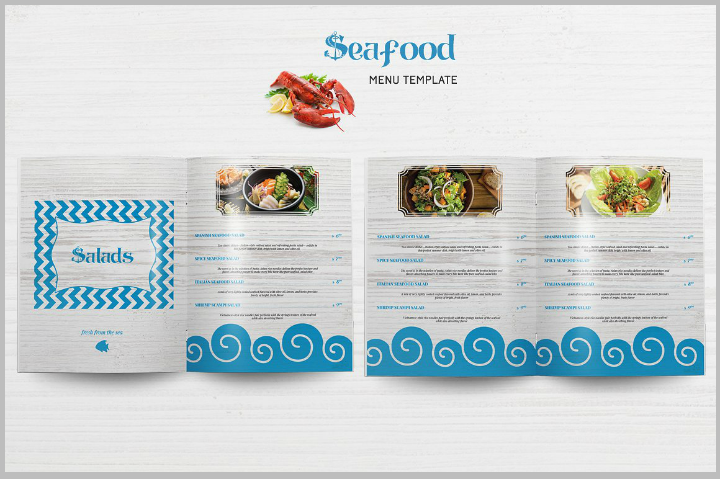 Find a template design that will suit your restaurant’s brand image and the kind of theme or concept you are following. 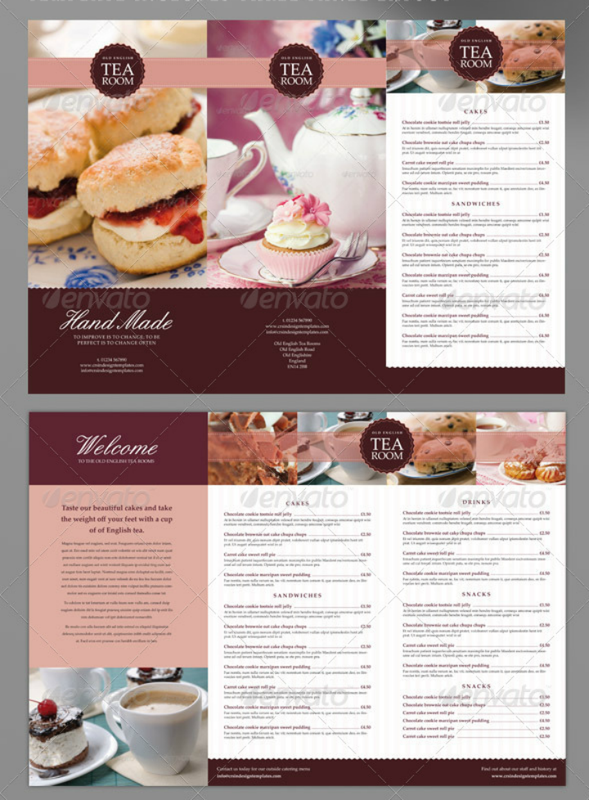 As mentioned earlier, this article focuses on the use of food menu templates using Adobe InDesign. 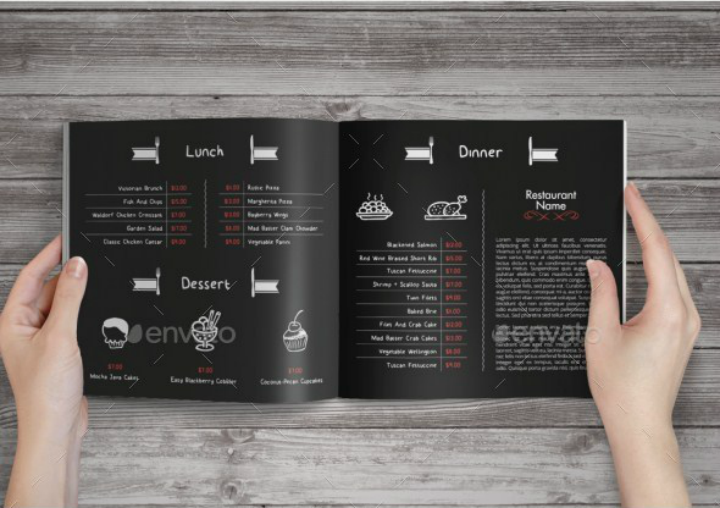 But before we provide more template examples, let us explore the different reasons how restaurants owners can benefit from using or updating their menu cards. Read on. Free marketing tool. One way to help drive customers to any business establishment is through advertising. For restaurants, this may come through social media advertising, in-store and offsite billboard and banner placements, TV and radio advertising, and print media. Most of these methods follow the traditional route of advertising. But if you want to be business-savvy, you will use your restaurant menu as a way to advertise your business. For example, you may use matching restaurant logo designs and follow an easy-to-read format. When done right, customers will readily associate your restaurant logo with your delicious food offerings. Organize food menu offerings. Another advantage of using a menu card is that they allow you to narrow down the important meals and dishes that your restaurant offers and present this in an organized manner. Customers appreciate it when they can easily understand what they read on the menu. A common way to keep a menu card organized is by making sure that your food offerings are divided into different categories (i.e. entrees, appetizers, salads, main dishes, desserts, beverages, etc). Some restaurants may even designate a separate menu page for affordable meal sets that customers can order. Entice diners with new and/or lesser-known dishes. Restaurants that offer different food varieties and meals will often overwhelm their customers with the number of available options. By using a carefully curated menu card, restaurateurs can prioritize meals and dishes that they want to sell more. You may also include a bestsellers portion where diners can readily take their pick of your most popular dishes. For dining establishments that do not offer full waited services like cafes and fast food diners, creating a highly targeted banner menu will allow your customer to choose meals or dishes while they wait in line. Doing this effectively often translates to lesser waiting time from ordering to having the food served. To stay more competitive. The restaurant industry is very competitive. And reinventing your restaurant’s menu choices is just one of the things a restaurant can do to help attract more customers. 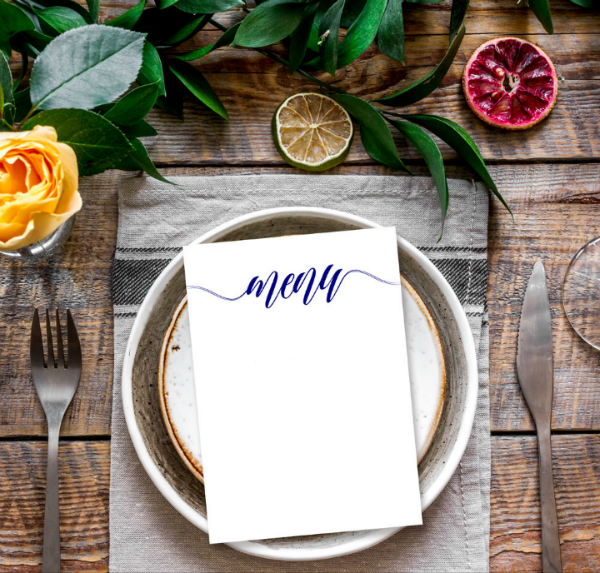 Updated and trendy menu cards tend to signal a company’s willingness to adapt to changes—often a good indicator of a restaurant’s commitment to quality food and service. Decreases customer wait time. Diners tend to eat more at restaurants that offer superb food and services. By using a menu card, you help decrease the amount of time a customer spends in being informed of and in choosing a food or dish to order. This helps streamline the entire process and makes sure that customers get to enjoy their meals right away. Of course, there are a lot of factors that will help determine a customer’s wait time in a restaurant. But focusing on one aspect (which is menu card creation) can help improve the overall brand strategy process in the long run. Helps create a more personalized dining experience. Another way to help boost a small business’ marketing process is by making sure that your customers thoroughly enjoy their time spent at your establishment. This tip is especially relevant to restaurant business owners. To illustrate, if a diner gets satisfactory wait staff service starting from his or her arrival to the time the ordered dishes are served until the time he or she leaves the restaurant, the diner will view this as a good, if not excellent, dining experience. All of these things contribute to creating a highly personalized and positive experience for the customer. Thoughtful, courteous, and respectful service will often come back in the form of continued patronage and increased sales. 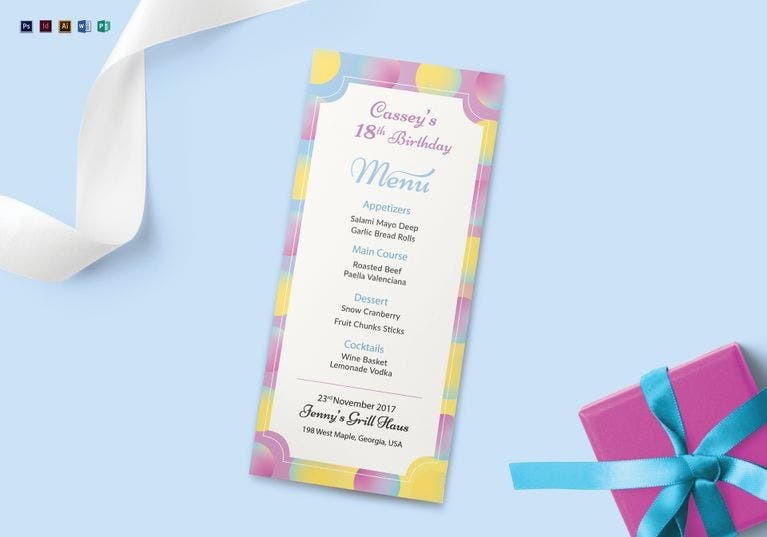 To small business owners, knowing the steps on how to create menu cards for your own dining establishment is very important, especially if you do not want to rely on a graphic designer or illustrator to do the job for you. 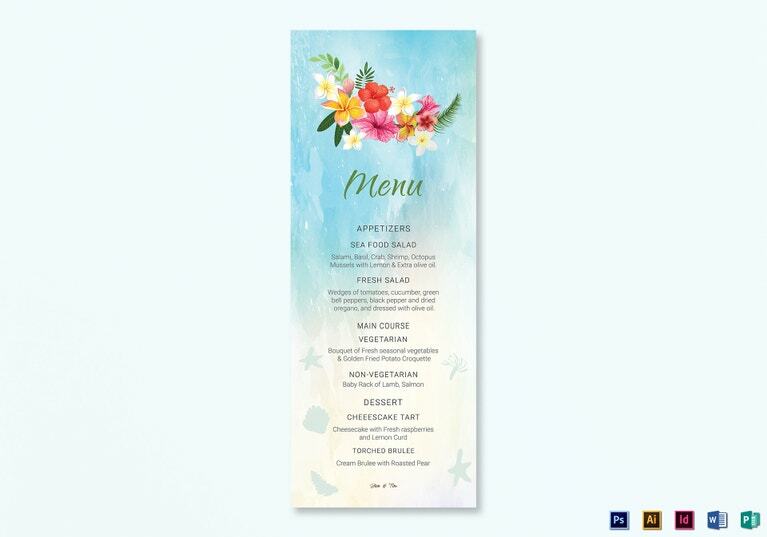 Extra care should also be taken when you use pre-made printable menu templates to ensure that they accurately showcase your brand’s image. To break down this entire process, we have listed the steps on how you may use and customize these InDesign menu templates and transform them as if they are original creations for your restaurant. Gather all information that you need to include on your menu card. 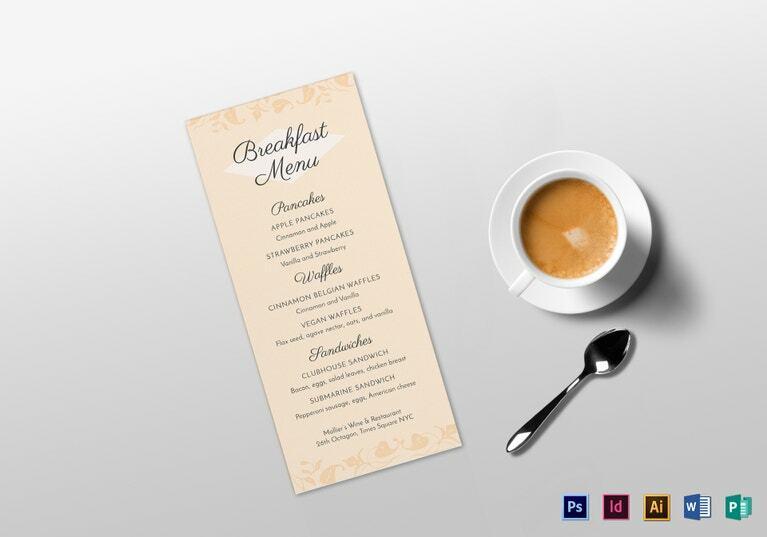 The first step that you should do before you can use InDesign restaurant menu templates is to gather all the information related to the food, meal, and beverage offerings that your dining establishment offers. These pieces of information are what will be printed on your menu cards. You also need to make sure that this information is accurate and up-to-date. Things like dish ingredients, meal plan components, pricing, and even calorie information should be verified. No restaurant owner would include false claims on their menu cards, right? Also, during the data gathering process, you may start typing out this information and then temporarily storing them in a text document. This will make it easier to copy into your chosen menu template later on. Make sure you have Adobe InDesign installed on your computer and you know how to use it. The next step is to ensure that you have the Adobe InDesign software installed on your computer. If not, take the time to purchase and install the software. In addition, you should take the time to learn basic InDesign skills. There are InDesign tutorials available online nowadays. You do not have to learn everything about Adobe InDesign. Basic skills like knowing how to copy and paste, move objects, and edit text boxes on the template will allow you to easily and quickly make changes to the menu template. Decide on a restaurant menu theme or motif. Another essential step before you can choose and use any InDesign menu template is to select a theme or motif for your menu card template. Note that this theme should coincide with your restaurant’s image. For example, if you own a coffee shop, you may need to use cozy or vintage-style menu templates. These two things should also coincide with the actual decorations and furnishings used inside your dining establishment. This helps create a synergy in your business that will also improve the ambiance of the place. Choose a menu template that will best showcase these criteria. Now, after making sure that you have completed all the preparatory steps enumerated above, it is time to choose the InDesign menu template that you feel will best represent all the template criteria you may have set. Remember, you do not have to look for the perfect menu template because you will not find one. Instead, what you will find is a menu template that will meet most of your design criteria and will also allow you to make minor tweaks. This degree of creative freedom is often better because it ensures that the final menu template output will be a unique one. Input all the menu and restaurant data you want to include in the menu card design. Once you have chosen a menu template, it is time to open the template in Adobe InDesign. Then you should start transferring or copy-pasting all the menu information. This may take a little while if you are creating a menu booklet. Most InDesign menu templates will already include image and text placeholders. Just read the directions on the template so that you will know where to paste a text or image. Check out this link for tips for different menu design hacks to increase orders. Customize accordingly. Next, you now have to customize the menu template. These edits may be minor ones like font size adjustment or they can be major ones like changing the layout of the template. Whatever you decide, always make sure to routinely back up your file so that you will not have to do everything again. It is during this step that you may add or edit different text and graphic design elements. Review grammar, spelling, prices, images, and fact check any information on the menu card. Once you are satisfied with the menu template customizations, ask someone else to review all the image, text, and design elements used in the template. It is better to have someone with fresh eyes look at the template so that he or she can provide better feedback. Finalize the menu card design. After that, it is time to make the necessary corrections of the errors or mistakes spotted by the template reviewer. Template design changes may also be done at this stage. And then, that’s it! You now have a completed menu template. Print on card stock or thick paper. 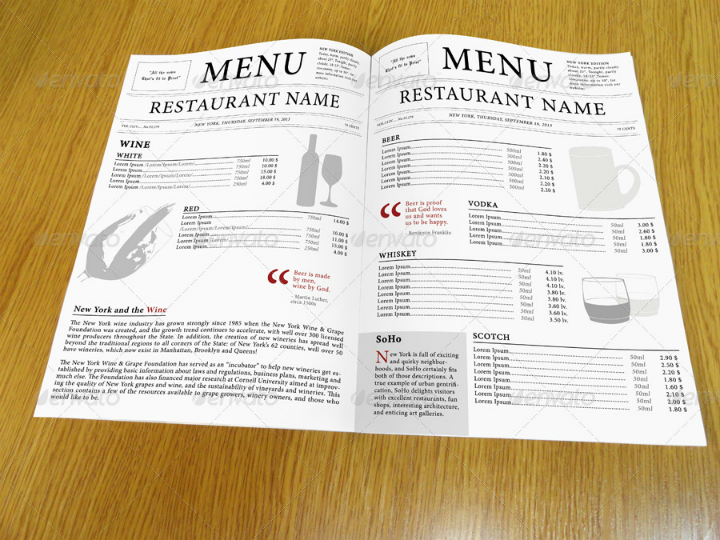 Once your menu template is completed, it is time to print it out. If you have chosen an InDesign template that calls for front and back printing, make sure to adjust your printer settings to accommodate this setting. 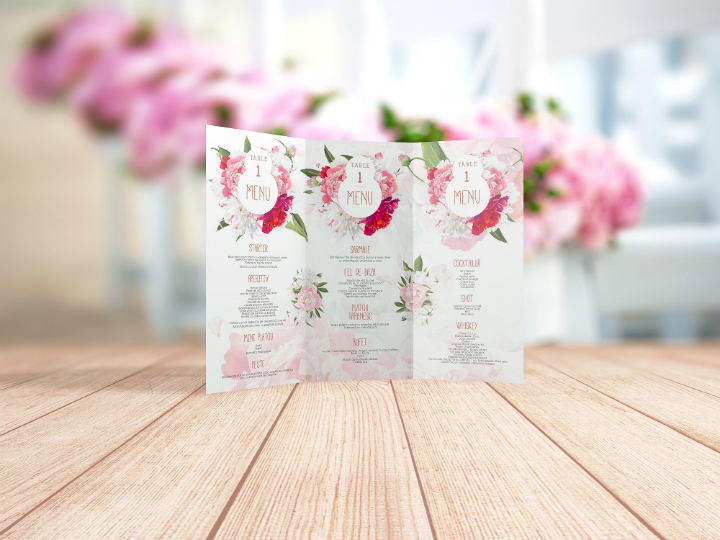 Also, you may have the template printed at a professional printing shop if you do not have a printer or if you want to ensure that your menu cards will be printed using high-quality commercial grade ink. 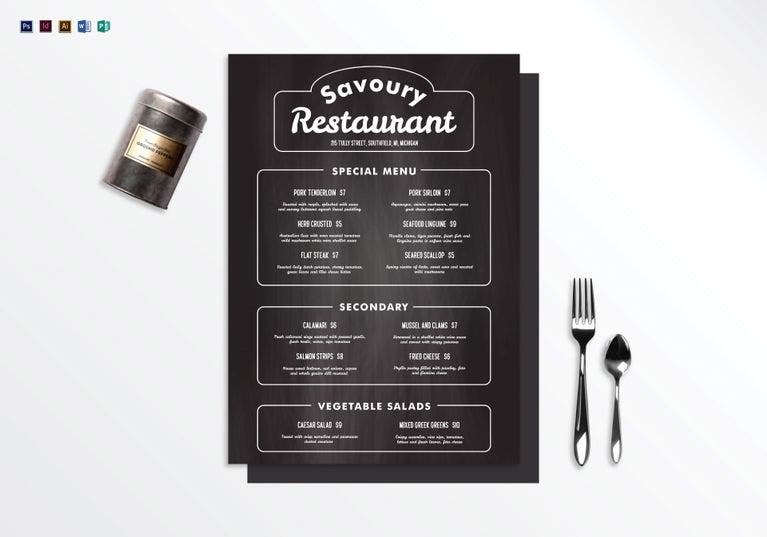 Tip: If you have a fine dining restaurant, you may need to print out your menu template on card stock. But if you are operating a fast food restaurant or a diner, having your menu template printed on thick paper should suffice. Pat yourself on the back! Yes, you now have a completed menu card! Congratulate yourself and good luck on your restaurant business! 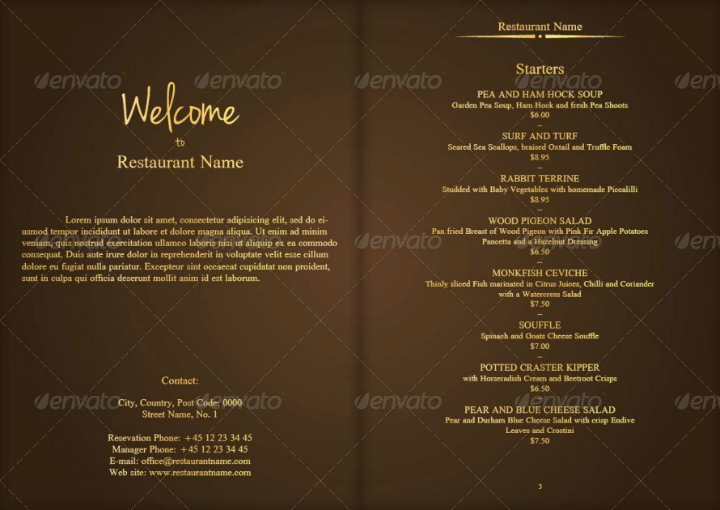 Knowledge of the psychology of a good menu design is very important when choosing among different InDesign menu templates. There should be a fine balance between a menu template design and the functionality the template brings to your customers. 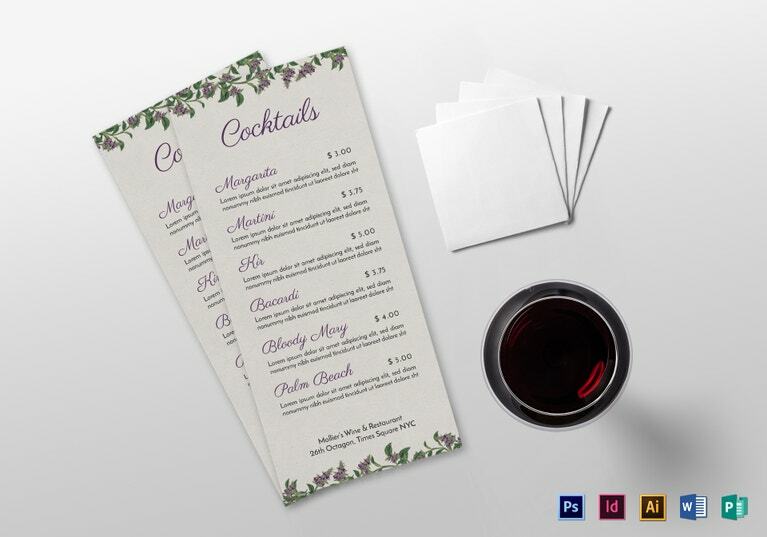 To illustrate, a colorful wine bar menu design template is useless if it does not accurately list all the kinds of wines and liquors that your establishment sells. In essence, a menu card is only as good as the information it imparts to its readers and how easily the customer understands this information. 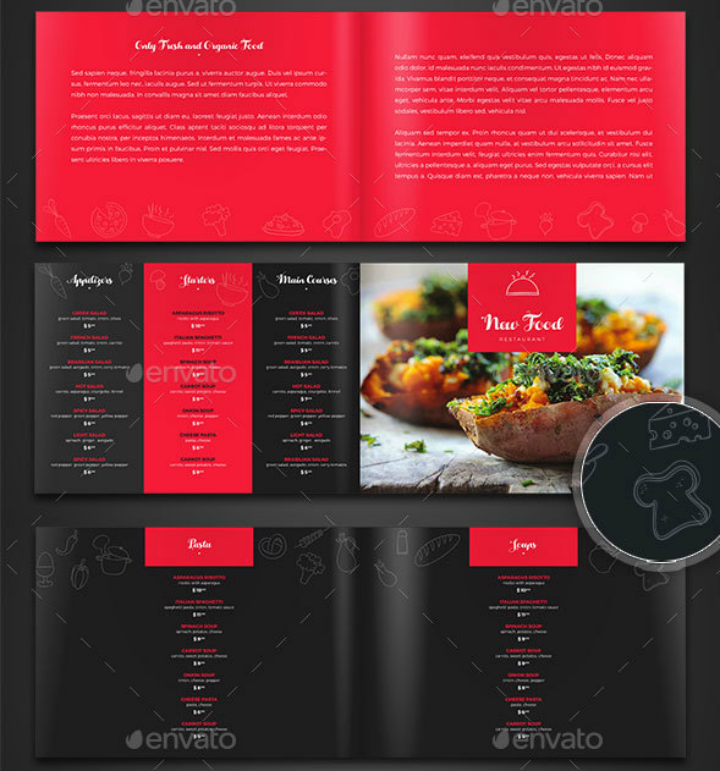 That is why you need to keep this factor in mind when choosing among different sample menu design templates. The collection of InDesign menu templates above may serve as an inspirational menu design springboard for you. 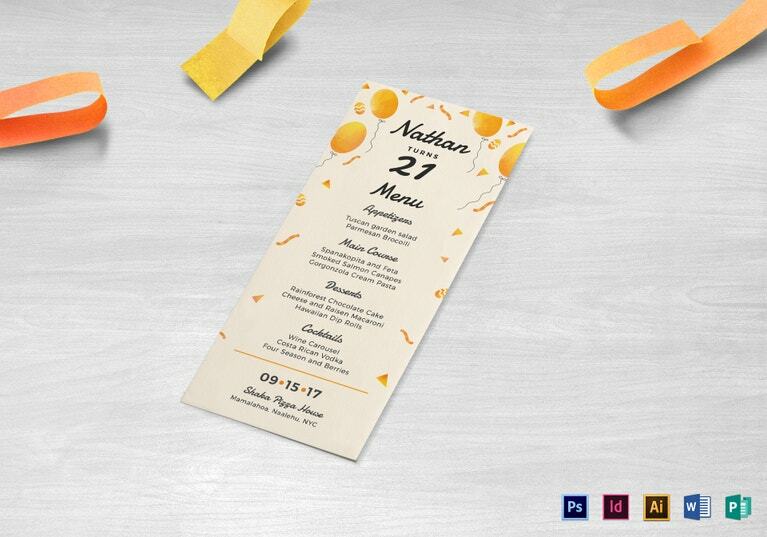 Let them inspire you so that you can transform them into unique menu cards for your own dining establishment.